In 2010 and 2011, scientists from the U.S. Geological Survey (USGS), Coastal and Marine Geology Program, acquired bathymetry and acoustic-backscatter data from the outer shelf and slope region offshore of southern California. The surveys were conducted as part of the USGS Marine Geohazards Program. Assessment of the hazards posed by offshore faults, submarine landslides, and tsunamis are facilitated by accurate and detailed bathymetric data. The surveys were conducted using the USGS R/V Parke Snavely outfitted with a 100-kHz Reson 7111 multibeam-echosounder system. This report provides the bathymetry and backscatter data acquired during these surveys in several formats, a summary of the mapping mission, maps of bathymetry and backscatter, and Federal Geographic Data Committee (FGDC) metadata. 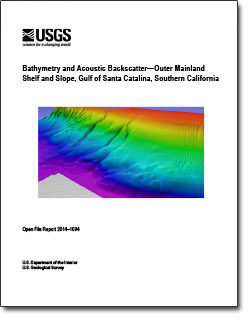 Dartnell, P., Conrad, J.E., Ryan, H.F., Finlayson, D.P, 2014, Bathymetry and acoustic backscatter—outer mainland shelf and slope, Gulf of Santa Catalina, southern California: U.S. Geological Survey Open-File Report 1094, 15 p., https://dx.doi.org/10.3133/ofr20141094.